Signature Moving provides the insurance and protection you can count on. We are fully licensed and insured with the necessary state and federal operating authority. Learn more about the state mandated options ALL legitimate Georgia moving companies must provide. Below is the content and downloadable PDF for the ADDENDUM TO UNIFORM HOUSEHOLD GOODS BILL OF LADING - SHIPPER DECLARATION OF VALUE. Important: There are two (2) state regulated options available to cover loss and/or damages. Actual Cash Value. This option provides for reimbursement for loss or damage NOT EXCEEDING three hundred dollars ($300.00) PER MOVE, based on the depreciated value at the time of the loss or damage. This option is included in the transportation and there is NO ADDITIONAL CHARGE. Should your goods be involved in a catastrophe such as fire, accident or of any other nature, the Carrier will assume liability not exceed twenty-five hundred dollars ($2500.00). Carrier shall have the options of repairing and/or restoring to the original condition. Full Value Protection. This option provides coverage based on current replacement value at the time of loss or damage, up to the dollar amount of valuation declared by you. The cost is based on the actual value of the goods, and the Deductible, if any, declared by you. carrier shall have the option of repairing and/or restoring to the original condition. Prior to the move the shipper must select one of the options below. If the shipper refuses to select one of these options, the carrier will not be required to perform the move. Option 1 - (Depreciated Value) - $300.00 per move based on the depreciated value at no additional charge. Option 2(a) - (Replacement Value) - (See Note) $__________ with no deductible at a charge of $11.30 per thousand ($1,000.00) of decalred value. This would result in an additional charge of $___________. Option 2(b) - (Replacement Value) - (See Note) $___________ with a $300.00 deductible at a charge of $3.75 per thousand ($1,000.00) of delcared value. This would result in an additional charge of $____________. NOTE: Must be an amount equal to or exceeding $5,000.00 per room excluding halls, attics, garage, closets and baths. A self Storage unit of 10' X 10' will constitute a room. The Shipper Declaration of Value must be completed PRIOR TO MOVE and made a permanent part of the Bill of Lading. 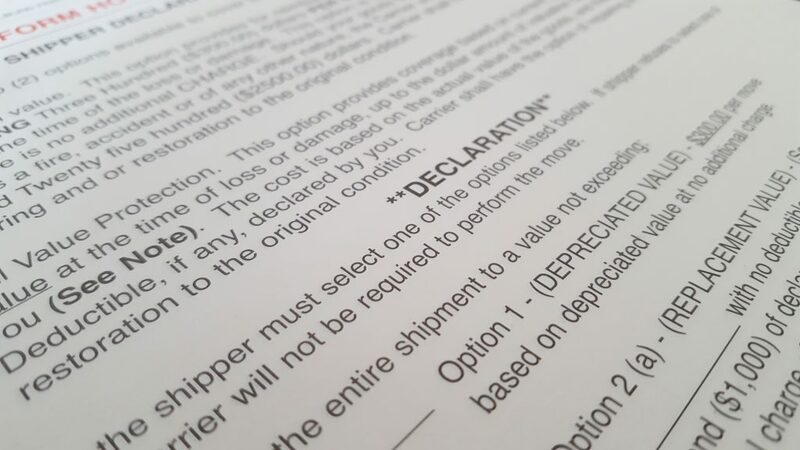 If carrier fails to require shipper to choose one of the above Liability Options, the shipper will be considered to have chosen 2(a) (REplacement Value, no deductible) at no charge to the shipper. Contact us and let's get moving!